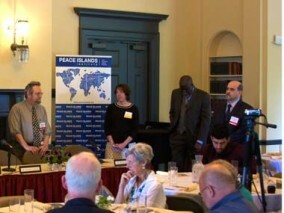 May 8, 2012, The Princeton Theological Seminary hosted the Peace Islands Institute in an Abraham's Table. The theme was "Moral and Messy, Faith and the Political Process". Each speaker shared their own perspective on the topic. Lunch was provided by PII volunteers. PII thanks Fellowship in Prayer for partnership and for making this event possible. What Does Holy Land Mean to Me? Abraham's Table "Mary in Christianity and Islam"